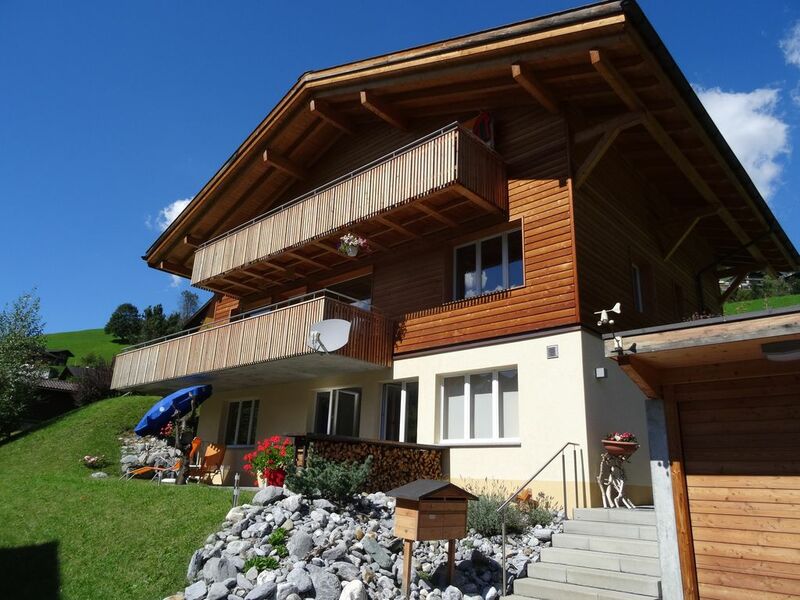 Bright 2.5-room apartment in a newly built two-family chalet (built in 2010). 3 * star superior standard for vacation apartment Classification Swiss Tourism Federation, 37m2 living area, free parking, free Internet access via Wi-Fi. The apartment is located on the ground floor with a separate sitting area and a beautiful view of the mountains. Modern kitchen with dishwasher, oven, ceramic hob, capsule coffee machine (Delizio), filter coffee machine and kettle (fondue or raclette dishes we lend on request), dining table and living room. Separate bedroom, shower / WC, TV / radio. Pets not allowed, Non smoking. 2 minutes to the ski and local bus stop, 5 minutes to Maennlichenbahn with skis. Showers and towels available and included in the price. 10 minutes walk from Grund Station and the Mannlichen chair lift makes this an ideal location for using a Regional Pass. Amazing views of the Eiger. The apartment is clean and the owners friendly. We are so grateful that we were able to stay at Karin's amazing apartment! She picked us up at the train station, gave us recommendations on what hikes to do in Grindelwald, and was an extremely kind host. The apartment has a spectacular view of the Eiger and is walking distance from the main part of Grindelwald. It is clean, modern, and spacious and perfect for a mountain getaway. We loved staying at Chalet Blum, it was the perfect place to stay while in the Berner Oberland. Karin is a wonderful hostess and made sure that everything was as we thought it should be, you can tell that she truly cared about our comfort and experience. The apartment was absolutely spotless, like it was brand new, not a speck of dirt. Karin offered to pick us up from the train station when we arrived so we didn't have to deal carrying our luggage and she dropped us back off at the station at the end of our stay. The apartment has everything you need to cook your own meals (except the food) and the grocery store was within walking distance, although you do get a free bus pass and can take it to the grocery store, if you would like. It is very quiet and enjoyable at the apartment, it even has a nice patio to sit out and enjoy the beautiful views. Staying at Chalet Blum was very reasonably priced and if we are ever in the area again, we will most certainly stay at Chalet Blum. This was our first time staying with VRBO and Karin has made it a fabulous experience. My husband and I and our toddler stayed her for four nights in September. What a wonderful place! The apartment is new and clean, with good view of Eiger. The kitchen is equipped with amenities for cooking and the sitting area comfortable. Karin provided a high chair and cot for our toddler which was very helpful. She is a wonderful host and has provided and information booklet about the area in the apartment. Not only was the location close to the bus stop, Mannlichenbahn and train, but Karin is one of the sweetest people you'll ever meet. And the place is reasonably priced. I would highly recommend staying here! Sehr saubere und praktische Wohung für 2 Personen. Sehr ruhig gelegen und sehr nette Gastgeber. Wohnung ist sehr praktisch und zweckmässig eingerichtet. Kein Luxus, aber passend. Sehr sauber, ruhig und sehr freundliche Vermieter. Diese Ferienwohnung können wir sehr gut weiter empfehlen. Es war sehr sauber, ruhig und sehr nette Vermieter. Wir kommen gerne wieder! The world-famous resort of Grindelwald is around 1050 meters above sea level. at the foot of the Eiger North Face and is well known for its beautiful mountain panorama. In summer as well as in winter countless leisure activities are available to the guest. Be it for hiking, biking, Nordic walking, climbing, swimming, skiing, snowboarding, winter hiking, snowshoeing ... with us you just right! Grindelwald is thus the ideal starting point for all activities in the area of ​​the UNESCO World Heritage for young and old. Other Activities: Climbing, Nordic walking, snowboarding, sledging, snowshoeing, winter hiking. Ski: In winter, there are around 215 km of groomed slopes available to skiers and snowboarders, connected by 45 lifts and ski lifts. These are the three subregions Grindelwald-First, Grindelwald-KleineScheidegg-Männlichen and Mürren-Schilthorn. From the beginner to the racer - everyone will find the right track! Overall, more than 50% of the slopes can be snowed. Bettwäsche, Küchentücher, Badtücher und Endreinigung sind im Mietpreis inbegriffen. Zusätzlich verrechnet wird die Kur- und Beherbergungstaxe von CHF 4.70 pro Person und Tag, diese ist fällig bei Anreise (bar in Schweizer Franken) Bei einer kurzfristigen Reservation (Zeitraum zwischen Buchung und Anreise = weniger als 7 Nächte) erhalten Sie 10% Rabatt!